Dessiana is an active city in the game Shop Heroes. -You can find basic information about the city here, as well as city raidscores & crown jewel information. -The forum is available for discussions/questions outside the city chat, and has info about current (raid) events, prizes & prize winners. City Chat: English, in-game city chat. Reasonably active, occasionaly a very silent day. Inactivity/Leeching: Standard removal from the city after 2 weeks of inactivity/low raiding without explanation. (Unless a player just joined us, in that case they will be kicked out after the first raid). We expect everyone to cover at least their fair share of the raid rewards they can get. Finishing a raid takes 40K points, which means 1600 points per player. Many of us enjoy raiding quite far beyond that, so we have no trouble compensating for lower levels that cannot achieve 1600 points yet. Always make sure you chose a city where you can keep using the buildings for your own benefit. We're a max lvl (=expensive) city, so our Inn and Townhall cost 3.75M to use (other buildings several million, castle 50M). 1G+ investments in a low city for cheap basic development would be reccomended. We always have some friendly competition going on in the weekend for some small extra rewards. It's just to keep things more interesting. The standard rewards that you get for finishing a raid when you're lvl 45+ are already worth 450+ gems, (which is ~4G worth of gold). So extra raid rewards are always just a small bonus. -The type of competition & rewards can always be found in the Mayor's Message tab when the raid starts. -The winners will be posted there on monday and can put up a city request to recieve their prize. -Raid details are always posted on our forum, because on occasion, the (prize) info and list of winners/rewards is so long that it will not fit into the mayor's message. Competitions vary each week, and can be anything from raffles to a top 5-10 and random rewards or layered rewards. Top raiders often get a garanteed prize for all their effort, and everyone else often has a chance to win something as well. The basic requirement to qualify for extra rewards is always to cover at least your fair share of the points: if you are below that, you will not be able to win random rewards or raffle prizes. (And raiding below fair share often will lead to city removal). Extra rewards vary and depend on what I have in stock. Usually its 5 or more lvl 25-45ish epic items, with an occasional raffle for a few legendary items (usually once a month). I try to make sure rewards have a value of at least 20gems each. Players are free to do with their rewards as they wish, for newer players the epics are often still decent upgrades, and more advanced players may wish to sell them for gems or use them for fusion instead. Sometimes, other neighbours add items to the prizepool. In that case prizes are given out any way they would prefer, so need before greed for example can be an additional requirement in that case. Top X and random reward style events are pretty self explaining. How raffles work often leads to questions. Basically it's a lottery, every 500 points you score gives you a "ticket" for a chance to win something. After the raid finishes, all of the tickets earned are counted & numbered. After that a RNG (random number generator) is used to select the winning tickets. The first ticket selected by the RNG will recieve the highest valued prize, the 2nd drawn ticket will be for the next most valuable item, and so on, untill winners for all of the prizes have been selected. With raffles, players can only win 1 item max, so if you got lucky and won a high value item, your tickets will not count for the other lower rewards of that week. If a winners ticket gets selected again by the RNG, it will be rerolled. Everyone above fair share has a chance to win the top rewards with a raffle. Players that are very active and collect more tickets will have a higher chance to win. The prizepool was 3 legendary items and 2 mythicals. 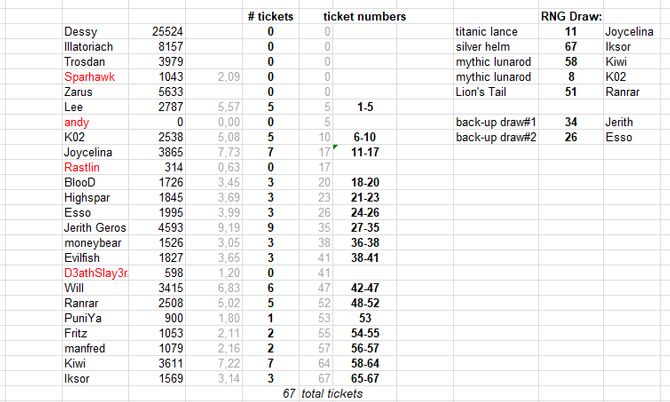 Based on their gem value (checked on the trade house the moment the raid ended) the legendary titanic lance was the top prize, and the legendary lion's tail the lowest. 4 of the top raiders passed on rewards and a few players raided below fair share, leaving a total of 67 tickets. The RNG (1-67) selected 11, 67, 58, 8 and 51 as winning tickets. (and I usually roll a few back-up numbers, just in case any of the winners decide to pass on their reward). I usually try to craft 5+ of the same item as rewards, but on occasion I have a whole bunch of different level epics in smaller amounts. With layered rewards, the top raider will recieve the highest value item, and the lowest ranking prizewinner will get the lowest value item from the prizepool.